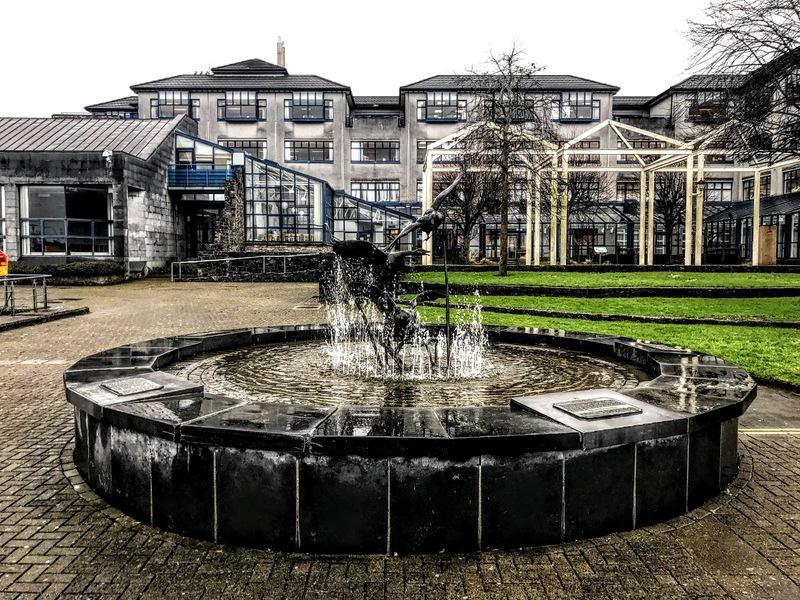 City Hall in Limerick is an impressive building facing out onto the River Shannon, with carefully manicured lawns and a fountain commemorating the Wild Geese, the Irish officers and leaders who left the country, mainly for France and Spain, after the Treaty of Limerick. City Hall was moved to this location in 1990, on a site not far from the original Thingmount, reputedly the seat of Viking government in the early city. This site was occupied by the former City Gaol until it was demolished in 1988. However, most of the front façade, facing onto Crosbie Row, was retained and was incorporated into the new civic offices. Here some steps lead down from Saint Augustine Place to Merchants’ Quay. The old City Gaol was built in 1811-1813 in an area known as Dean’s Close, between the Quays and Saint Mary’s Cathedral. 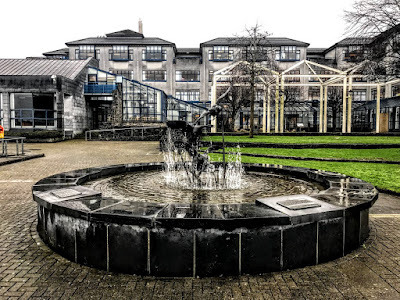 Crosbie Row was named after Maurice Crosbie, Dean of Limerick (1771-1809). 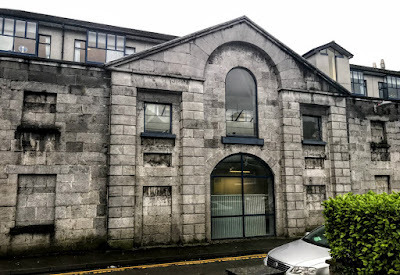 The surviving façade is all that remains of the gaol built to designs by the English architect, John Nash (1752-1805), whose work is rare in Ireland. It is possible that the Limerick-based architect James Pain was the clerk of works to Nash when the gaol was being built. Nash was responsible for much of the layout of Regency London under the patronage of the Prince Regent, and during his reign as George IV. He was also a pioneer in the use of the Picturesque in architecture. His best-known buildings include Buckingham Palace, Marble Arch, Park Crescent, Regent Street and Carlton House in London and the Royal Pavilion in Brighton. His few works in Ireland include the Vice-Regal Lodge (now Áras an Uachtaráin). Today, the five-bay two-storey limestone breakfront façade of the former gaol can still be seen on Crosbie Row. It has a recessed double-height arch dividing the pediment. The rusticated limestone ashlar piers grouped in pairs with square stringcourses. There are square-headed blind window openings with limestone sills flanking the breakfront, and square-headed blind door openings flanking the central three-centred arch with recessed panels above. The whole is integrated into a coursed rubble limestone wall forming the north-west side of the City Hall. The architectural composition of the façade looks like a military building. Samuel Lewis described the building as a gloomy quadrangular edifice. Public hangings took place in the front of the gaol, which had been designed with a stage, or drop, in front to accommodate public spectators. Later, in the 20th century, the building was Geary’s sweet-factory, which remained there until most of the building was demolished in the 1980s. What remains today is worth keeping and preserving because of its rare Irish link with James Nash and Regency architecture.